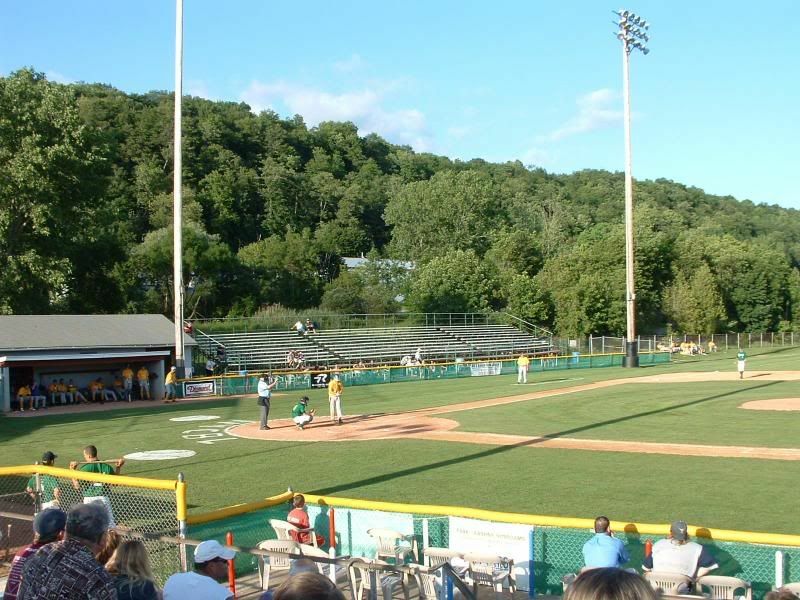 Our second NYCBL game in a month took us to the small city of Little Falls, New York. Veterans Memorial Stadium was once home to the New York Mets NY-Penn League affiliate, but that team left in the 1980's. 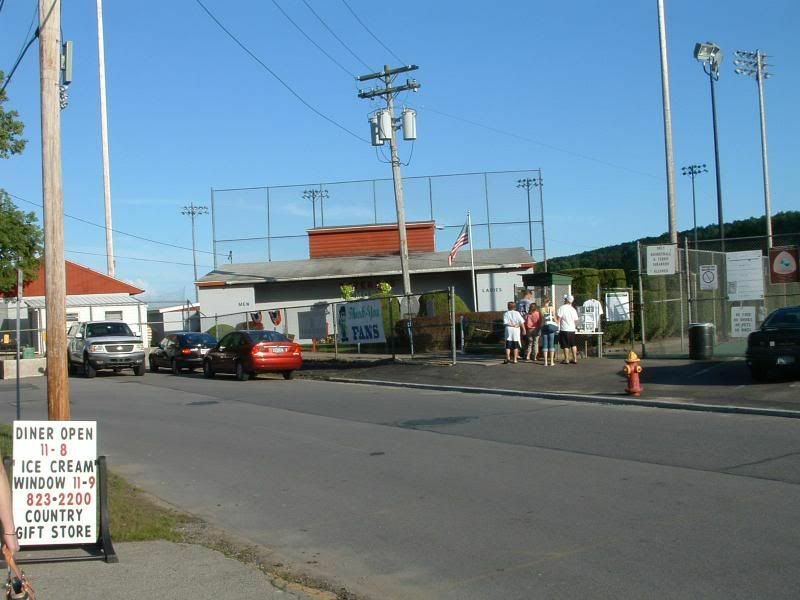 It has since been replaced by the Little Falls Miners, playing in the NYCBL. Where Dunn Field in Elmira has shown its age after the loss of 'affiliated' baseball, Veterans Memorial Stadium is the opposite. The stadium is clean, well kept, and probably one of the nicest landscaped stadiums we have ever seen. 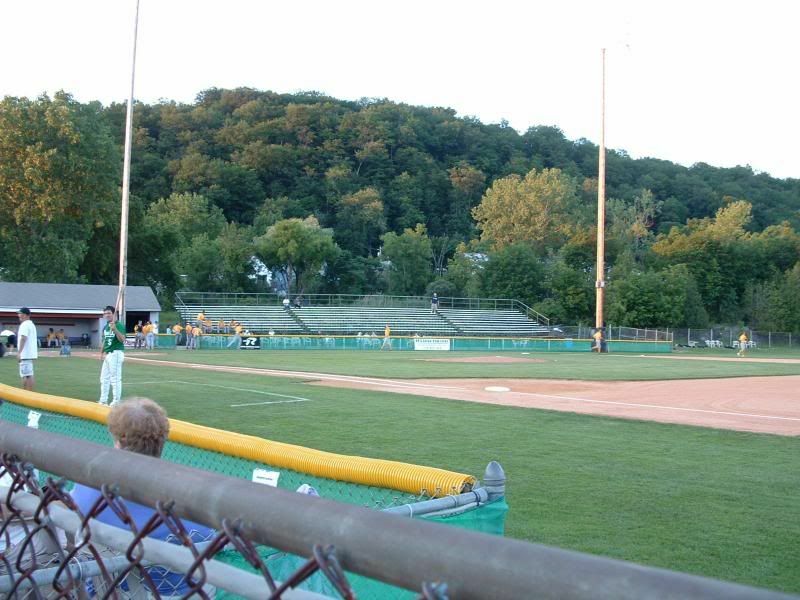 Granted, most stadiums don't have the open space for landscaping, but this wasn't the case in Little Falls, and it actually added to the 'ambiance' of the game. As I've said before, there's nothing better than sitting in the stands on a lazy summer night, light breeze blowing by, blue sky and puffy white clouds overhead, rolling green hills all around. Little Falls meets this 'perfect' criteria on all levels. Seating is down both the first and third base lines, with the press box behind home plate. A small concession stand sits on the 'concourse' just behind the press box (selling grilled ballpark usuals), and a second (we'll call it a sattelite location) concession stand is down the first place line, selling candy and even better BEER! The play on the field was much better than the game we watched in Elmira as well, even though it was the same league. After the game, we made the drive back to 'Home 2' in Cooperstown. Joaquin Valdes (Palm Beach Atlantic University) jacked the ball out of the park in the first inning when the Miners looked at a 6-0 ballgame in their favor. However, the Wizards had a gallant comeback, tying the score in the seventh at 6-6. The usual seven inning game of a doubleheader was prolonged into extra innings. The Wizards managed to put another run on the board in the top of eighth, which was soon matched by the Miners in the next half inning. Dave Wendt (Dowling College) started off with a single and was soon plated by center fielder Nick Campbell’s (Bryant University) base hit. The see-sawing effect of runs and hits from both sides were put to a halt in the ninth inning, when the Wizards scored another run and pulled away with the 8-7 win. Zach Thoma (University of Kansas) was 2-for-3, Campbell was 3-for-5, and Tony Luciani (Curry College), Wendt, Taylor Traub (Oakland University), Jeff Lieneck (Wheaton College), and Valdes collected base hits, Valdes with 3 RBIs. Starting pitcher Jimmy Hoyt (Centenary College) threw for four innings, gave up four runs on six hits, and struck out five. Eric Fama (Rhode Island College) pitched for over three innings and gave up two runs on four hits, and snagged six strikeouts. After the lineups were switched around, the teams took the field for a second match up on the evening. The Wizards came out taking an early lead of 1-0 on the Miners starter Jared Barnes (Wheaton College). The Miners fought back in the second inning with back to back hits by Wendt and Thoma, a sac fly RBI by Andrew Stafford (Oakland University), and a bunt by John Spatola (Boston College), evening the score at 1-1. Later, Little Falls etched in a run in the fifth and a run in the sixth, to result in a 3-1 ballgame in their favor. Barnes lasted a little over four innings on the diamond and allowed eight hits. Joe Rodriguez (Indiana State) threw for the remainder of the game and allowed only one hit. Both Barnes and Rodriguez walked away with three strikeouts on the evening and Rodriguez was served the win. The Miners have a pair of games with the Bennington Bombers coming up. Wednesday is at Bennington at 5 p.m. and Thursday is home at 5 p.m.